Microsoft is adding a power user move to Windows 8.1 that you can use to impress all your friends. The new Windows update, which rolls out as a public beta on Wednesday, will include an option to shut down or restart right from the newly returned Start button. For mere mortals, the new option may be hard to find, since it is buried in the right-click options. But for anyone who knows the right-click menu is there, the new addition will put an end to the drop and slide-up mouse maneuver currently required to begin the process of shutting down a Windows 8 PC. The Start button discovery was uncovered and quickly posted to Twitter (screenshot up top) thanks to the recent release of Windows Server 2012 R2 preview, which offers similar functionality to Windows 8. CNET points out the new shut down option will show up in the right-click menu whether you’re on the desktop or the Start screen. That’s not particularly surprising, since the current right-click menu is available on both sides of the Windows 8 interface as well. 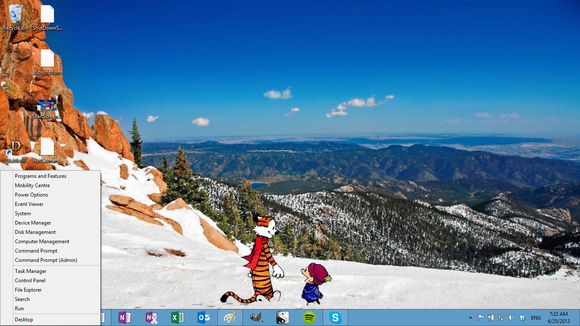 If the hidden menu in the lower-left corner of Windows 8 is news to you, here’s a quick recap. If you right-click on the lower-left corner of the screen, you get quick access to a number of features including the control panel, device manager, search, run, and the command prompt. It’s a useful option to know about, but unless you like tinkering with your PC it’s probably not something you’d use every day. 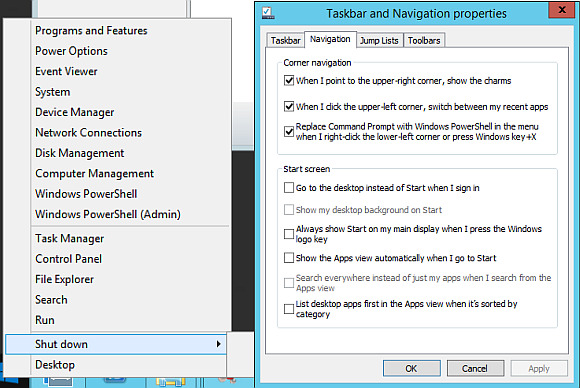 The Start icon right-click menu options in vanilla Windows 8. Microsoft also has a few other tweaks planned for Windows 8.1 that coincide with the return of the Start button. Another screenshot posted to Twitter (and at the top of this article) shows options to disable the upper hot corners entirely. Choosing those options means losing the ability to open recent modern UI apps with the mouse. But for anyone who only relies on the lower hot corners to navigate between the desktop and the modern UI, the new options will be a welcome addition. Beyond that are features we’ve heard about for some time including the ability to boot directly to the desktop, use desktop backgrounds on the Start screen, and show the all Apps view automatically when switching to Start. Windows 8.1 is supposed to correct some of the most heavily criticized mistakes from the original release of Windows 8 last fall. Although Microsoft has made some notable changes like the return of the Start button and the ability to boot straight to the desktop, the company hasn’t entirely caved to user demands. The traditional Start menu, for example, won’t be returning with the Start button, so users who really want that Windows 7 feel with Windows 8.1 will still need to look at third-party options such as Classic Shell and Start8.